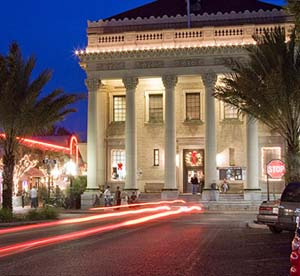 Several buildings in Gainesville, Florida, are listed on the National Register of Historic Places, including the former U.S. Federal Building and Post Office (1911), now home to the Hippodrome State Theatre. Gainesville, Florida, (population 124,491), was founded in 1854 and named in honor of Seminole war hero General Edmund Pendleton Gaines. Created as the county seat, Gainesville was situated in a central location on the state’s first bi-coastal intrastate railroad line. After the Civil War, the city grew to be one of the largest cotton shipping stations in the South, complemented later by expanding the economic base with citrus and vegetable crops. Phosphate and lumber succeeded the citrus industry when freezing temperatures devastated the citrus crops in the 1890s. Gainesville has five residential historic districts, three of which are listed on the National Register of Historic Places, as is the University of Florida Campus Historic District. Several buildings are also listed on the National Register, including the former U.S. Federal Building and Post Office, completed in 1911, and now home to the Hippodrome State Theatre. Gainesville is working to restore its declining historic neighborhoods. The city and other local partners have established the Model Block Program to rehabilitate two historic neighborhoods in the city center. Attractions include the Matheson Museum complex, which features archives, a library, exhibits, and a historic house museum. Just south of the central city district a historic depot is being rehabilitated into a museum dedicated to the railroad experience in Gainesville. Walking tours of the historic districts, driving tours of the region, and other interpretive opportunities are available to help visitors explore the city’s history. Local festivals, performing arts, the University of Florida’s Florida Museum of Natural History, the Samuel P. Ham Museum of Art, and the Curtis M. Phillips Center for Performing Arts also enhance Gainesville’s cultural life.